Rose Ffion, RID is a many time Champion Select Hornby Premium mare imported from England. Her winning streak started early as a foal when she won first in her foal class and then took the Foal Championship at the Irish Draught Newport Show. As a 2 year old, Ffion won Reserve Champion at the Newport Show and 4th at the Irish Draught National Show in England. Impressive as a young mare, she was crowned Champion still again at the Royal Show, the Great Yorkshire Show and then she was featured in Britain’s top equestrian magazine, Horse and Hound. In 1995, in a very strong class, Ffion won the Breeding Championships at the National Irish Draught Show in England and took Reserve Champion for another class. To add to an already victorious day, Ffion’s colt at foot, by Gortlee Ruler, also won his class and thus carrying on Rose Ffion’s winning tradition. Upon his stallion approvals, Manu Forti’s Rakish Lad, ID by Hillviewfarm Milligan, RID, will also carry on Ffion’s great legacy. 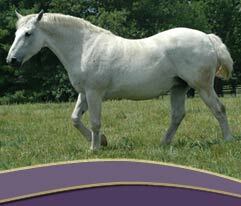 Ffion’s bloodlines boast some of the most influential Irish Draught stallions in history. She is by Finbarr, RID who is sired by Pride of Shaunlara, RID. Pride of Shaunlara, RID is one of the greatest sires of all time, producing captivating presence, breed type and jumping form. Ffion’s dam is Cherie Rose, by Colman, RID. Colman, RID is highly noted for being one of the most impressive movement producing sires of Irish Draughts. Cherie Rose has produced many Champion Heavy Weight Hunters in the UK. In 1986, one of her Hunter colts sold for a top price to Vin Toulson (top show hunter rider). This colt later won at the Royal Show under Vin Toulson. Ffion is of exceedingly rare type in that she has tremendous bone, near flawless breed type and conformation. Her super movement is also remarkably light and extended. It was said that England regrets the export of “one of their last great mares.” At the grand age of 22 this year, Ffion remains sound and lively. Trained under saddle on the busy streets in England, Ffion will enjoy relaxing trail rides over gentle rolling hills surrounding our farm. 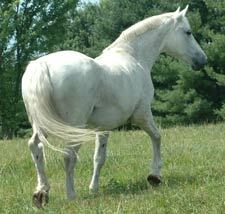 She will also be put in foal to our stallion, Bridon Belfrey, RID in attempts for a 2009 foal. We are most grateful to Simone and Doug MacKay of Manu Forti Farms for entrusting us with this grand and exquisite Traditional Irish Draught mare. We feel honored to have been chosen to give her a loving retirement home.